I wrote a new article for Global Couture that I think a few of us might have/are/will go through as a naturalista: Hand In Hair Syndrome (HIH). In case the term is new to you all it basically means it that you “suffer” from constantly touching your hair – your hands are constantly in and and around your hair. Do you “suffer” from HIH? What steps do you take to try and stop touching your hair throughout the day? 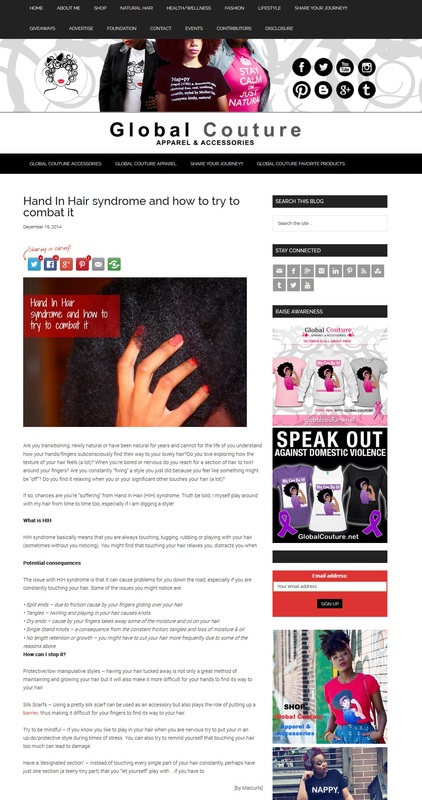 This entry was posted in Global Couture, Hand In Hair Syndrome, Natural Hair Care, Natural Hair Magazine, Natural Hair Site and tagged Combating Hand In Hair Syndrome, Consequences of Hand In Hair Syndrome, Global Couture, Hand In Hair Syndrome, HIH, Natural Hair Magazine, natural hair site, What is Hand In Hair Syndrome on December 19, 2014 by Maicurls. I don’t have HIHS but I can definitely understand when you transition and you want to feel your new growth and just get excited about your curly roots. Thank you dear, indeed, HIH, especially when my hair was shorter, but protective styling has helped me out a lot! Protective styling has been a huge help in cutting down on how much I play in my hair but it also really helped me to try to figure out what parts of my hair I like to touch most. I realized that my roots and new growth are the places I prefer to give the greatest attention to at any given time so scalp massages are my way of doing something good for my scalp and I get to touch my new growth. I enjoyed your insight on this subject. Hey Sen! Thanks for sharing 🙂 It is great that you found a way to do something good for your hair will getting to play around with it too 🙂 Yup protective styles definitely make it more difficult to mess with our hair too much. Thanks again for commenting and sharing!